Macau the Macau Special Administrative Region of the People's Republic of China – one of the two special administrative regions of the People's Republic of China, the other being Hong Kong. 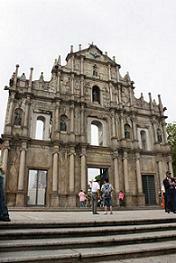 Macau lies on the western side of the Pearl River Delta, bordering Guangdong province in the north and facing the South China Sea in the east and south. The territory has thriving industries such as textiles, electronics and toys, and a notable tourist industry that boasts a wide range of hotels, resorts, stadiums, restaurants and casinos.